This book is a mixed bag and not in a good way. The book description says "this book is an in-depth look at costume design and illustration. Showcasing an educational process breaking down the problematic areas of costume design for the film, video game and animation industries". 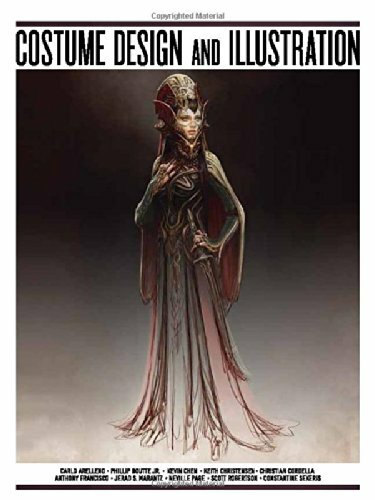 The thing is, this book is not that in-depth, and it most certainly does not break down the process for costume design. The featured artists just talk about what they do, but they do not address the why. There's no emphasis on explaining how they research, where they find their inspiration or reference, what are different parts of the costumes and why they are added and the function they serve, etc. The only exception is Kevin Chen who actually talks about the design, explaining the design concepts and what to think about when tackling costume design, such as dealing with porportion, cutlines, materials and functionality. There are a few step-by-step process walkthrough, and sometimes artists have helpful pointers, but most of the time they are just too brief or vague. Overall, this book is not very insightful for those looking to explore the concepts and ideas behind costume design. The artworks featured are great though, coming from professional artists like Constantine Sekeris the author himself, Scott Robertson, Neville Page, Jerad S. Marantz and more. I'm quite disappointed the book went in the opposite direction from what's advertised in the book description. This is more of an artbook rather than an educational or instructional book. For the book that it advertises itself to be, I'll probably rate it 1-2 out of 5 stars. As an artbook, I'll give it 3.5 out of 5 stars pulled down by the content.